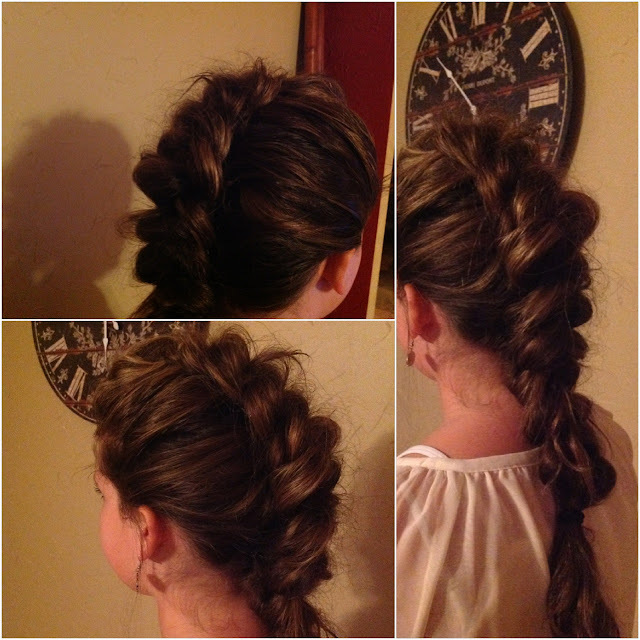 Last night, I called up my favorite cousin with magnificent hair to try out a new hair style I saw. 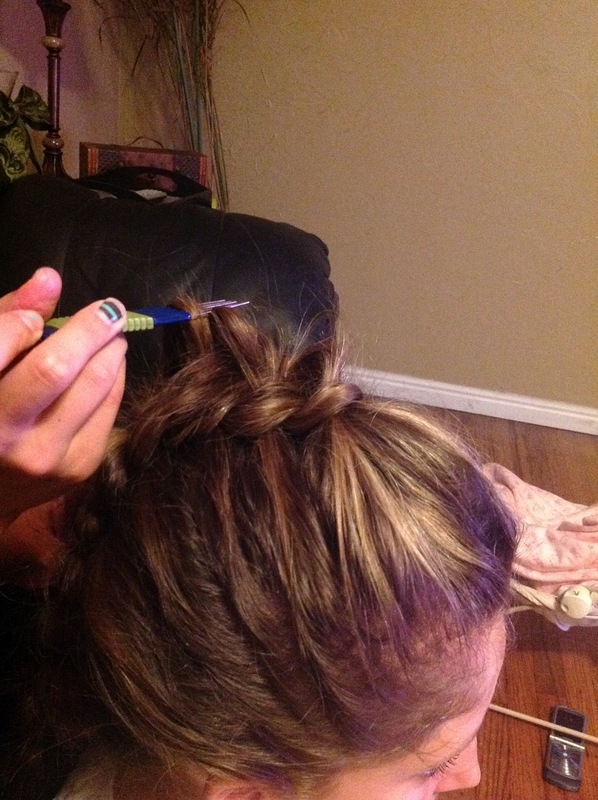 I like to call it, The Bodacious Braidhawk! If I had longer hair, I would TOTALLY do this one on myself! It's a good style to work when you're feeling a little rebellious, but want some class with it, too! 1. Take the front portion of your hair (where your bangs would be if you had them), and backcomb to give you a nice pouf in the front. Some people hairspray before they backcomb, but I would suggest hairspraying after you backcomb so as to hold the tease in place. Also, make sure you backcomb in the back. You want the volume, but not the messiness to show in front. 2. Begin an inside-out braid with your pouf, pulling hair in from the sides of the head, up to the top. Just in case you don't know what an inside-out braid is, it's basically the same as a normal braid/french braid, except instead of putting the hair pieces on top, you braid by taking the pieces and wrapping them around the bottom. Make sense? 3. 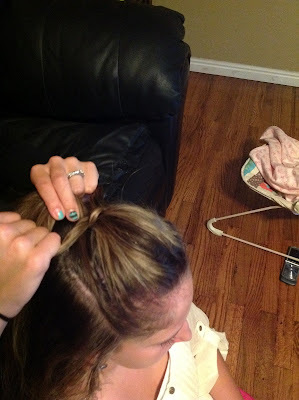 Complete the inside-out braid, leaving plenty of hair hanging out at the end of the braid because you'll be pulling the hair up in the braid and don't want the hair tie to completely fall out and lose your entire braid! Not fun. 4. Begin at the bottom of the braid and begin pulling hair up to make it messy and give it volume. It's kind of like shoelaces. When you want to tighten your shoelaces, you have to work from the bottom of the shoe and tighten from there. Same concept. Use your fingers and/or your comb. 6. Bobby-pin any loose parts of the hair. I wanted a more obvious distinction between Leanne's head and the braid, so I bobby pinned there to help with the distinction. 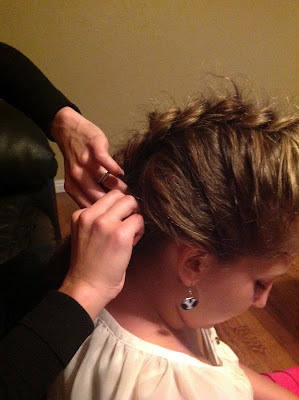 I also pinned just below the braid on top to give it more height. 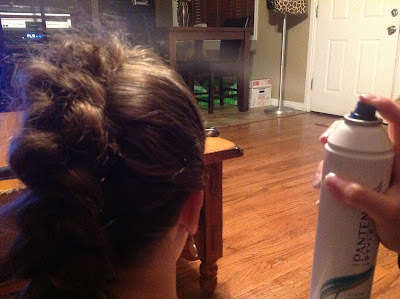 Hairspray helps with this, too. And you're done! To brush it out, start at the ends of your hair and work your way up. 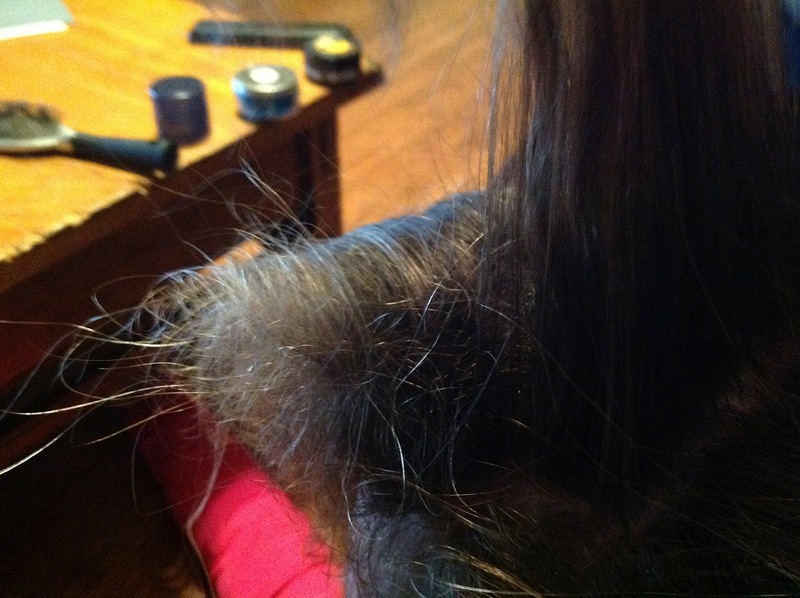 This lessens the harsh tugging and the wear and tear on your hair. Happy styling! If you see any neat hairstyles, let me know! I'd love to try another one out! Wowza. And I can barely get a bobby pin to stick in my hair right. So impressed!! 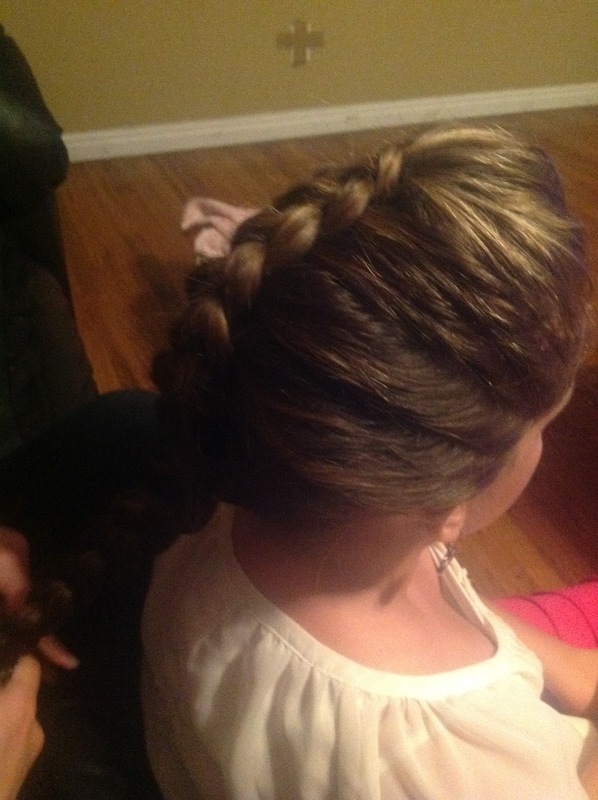 very good will try on daughter tonight isnt an inside braid called a dutch braid?